UNESCO believes that mobile technologies can expand and enrich educational opportunities for learners in diverse settings. Yet most ICT in education policies were articulated in a ‘pre-mobile’ era and they do not seek to maximize the learning potentials of mobile technology. The rare policies that do reference mobile devices tend to treat them tangentially or ban their use in schools. Today, a growing body of evidence suggests that ubiquitous mobile devices – especially mobile phones and, more recently, tablet computers – are being used by learners and educators around the world to access information, streamline administration and facilitate learning in new and innovative ways. UNESCO’s newly developed Policy guidelines for mobile learning should be embedded within existing ICT in education policies, which many governments already have in place. In order to leverage the opportunities afforded by mobile technology and other new ICTs, education officials may need to review existing policies. 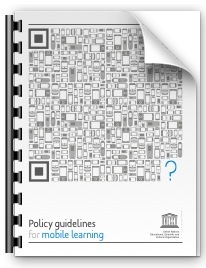 This set of guidelines seeks to help policy-makers better understand what mobile learning is and how its unique benefits can be leveraged to advance progress towards Education for All. Developed in consultation with experts in over twenty countries, the guidelines have broad application and can accommodate a wide range of institutions, including K–12 schools, universities, community centres, and technical and vocational schools. Policy-makers are encouraged to adopt UNESCO’s policy recommendations, tailoring them as necessary to reflect the unique needs and on-the-ground realities of local contexts. Written by UNESCO on March 28, 2013 in Mobile Learning Policy.